Just going through final edits for it just now – I’ve been a bit of an idiot and ended up with two books to edit at the same time; more on SNARED later. Needless to say, what started as a pair of short stories has grown to a monstrous novel, second-longest in the Cullen pantheon. Why do I do this to myself? WINDCHILL covers two cases over the festive period, two stories joined at the hip. Still reeling from the events of the previous Spring, Detective Constable Scott Cullen’s ambition has almost burnt him out. With his drinking out of control, Cullen’s hopes of promotion are dashed by the shrinking police force and managerial game playing – his only pleasure is the prospect of Christmas spent in front of the TV. In CHRISTMAS STEPS, when a corpse is found in a burnt down house, Cullen’s Christmas plans are pulled apart as he unpicks the victim’s life just as his own private life is picked apart by his boss, DI Colin Methven. In WINDCHILL, the murder of a young barman in his Edinburgh flat leads Cullen into the murky world of pubs and bookmakers, while the most likely suspect has a cast-iron alibi. 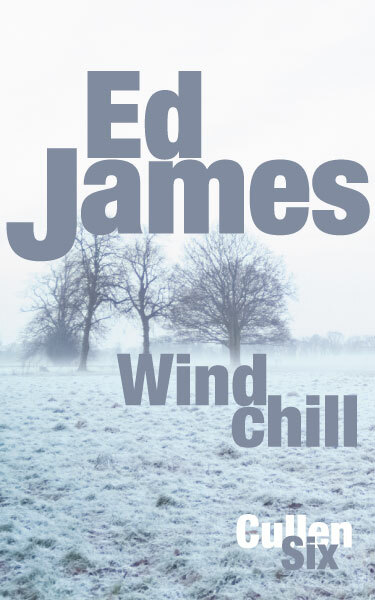 WINDCHILL is a claustrophobic police procedural novel about dashed friendship, alcohol abuse and trust. The sixth book in a series of Edinburgh-based police procedurals starring DC Scott Cullen, the first of which which has been compared favourably with Ian Rankin, Mark Billingham, Christopher Brookmyre, Ed McBain, Elmore Leonard and Stuart MacBride. Can’t wait Ed!!! Nearly finished my proofreading and copy editing course at last – 3 more assignments to go!! All thanks to you letting me attack your first two Cullen books – gave me the bug!! If you know of anyone who needs a proofreader I’d be more than pleased for you to suggest me – MB Proofreading – http://www.mbproofreading.co.uk !! !